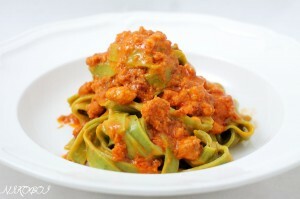 Ragù alla Bolognese Recipe – The Official Version! HomeRecipesRagù alla Bolognese Recipe – The Official Version! March 15, 2014 Comments Off on Ragù alla Bolognese Recipe – The Official Version! First, lightly fry the pancetta in a heavy-based saucepan until it is cooked through (not crispy). Add 3 tablespoons olive oil OR 50g butter, heat and add the chopped onion, celery and carrot. Leave this to fry very slowly on low heat until the juices become creamy.Add the minced beef, mix well and fry lightly on a medium heat until it is cooked through. Turn up the heat, add the wine and cook until it has evaporated. Turn down the heat. Add the tomatoes , mix thoroughly and simmer for at least two hours. The local ‘nonne’ or grandmothers say that when the ragù is ready ‘it calls you’. This is usually after it has been simmering for at least 5/6 hours (which will guarantee a truly superior ragù – do not be afraid to leave it this long). Stir occasionally and add a little broth if it gets too dry. Add salt and pepper when finished. According to the Bolognese tradition, some people add cream when the ragù is finished if it is used as a condiment for ‘dry’ pasta. Never to be used with cream for Tagliatelle!